Robert, the Fantasy Book Critic, has his wonderful series of articles for the end of the year where many authors make a review for 2008 and a preview for 2009. Through such an article I found a new upcoming novel which turned my interest on. And also the novel has a very interesting cover art. War has raged for twenty years between the Broekari and the Aidenists. Divided by their worship of different gods - each sons of the Creator, Ondun - it seems likely that the war will never end. But then the Aidenists make a startling discovery. 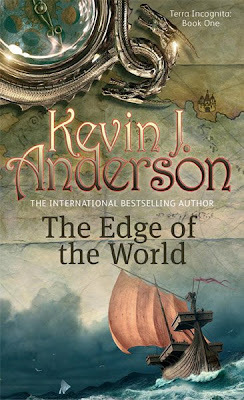 A merchant ship, sailing the very edge of the world, hauls aboard a large sea turtle. Inscribed upon its shell is an ancient map - a map that seems to show the way to paradise: the lost kingdom of Holy Joron, the third son of Ondun. Across the world, an ancient parchment is unearthed by the Broekari. This parchment also shows a map - a map that points the way to the Key of Creation, and thus to the kingdom of Holy Joron. And so the race is joined. Will the children of the sons of Ondun finally find peace in the fabled lost kingdom? Or will they take the hatred and death of two decades at war to paradise...? And I have to admit that the cover art turned my interest further on, because it has an interesting concept and an attractive look. So, I added another title for my wishing list of 2009. Another book for my growing list, but it looks to be worth the read. Thanks, Dark Wolf.